The year 2018 was a year of hectic consolidation in global agri business. Conclusion of the merger of six global corporations having diverse business interest into three mega corporations was an unprecedented corporate consolidation in agribusiness. The consolidation has given the three global entities dry powder of over 6 billion dollars to invest in innovation acquisition and futuristic research. 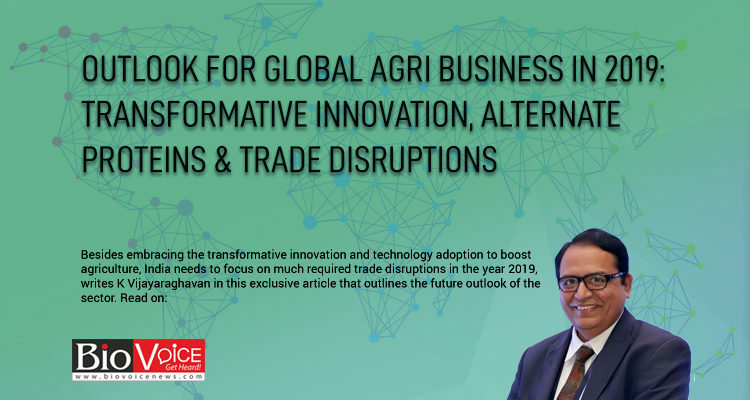 The 2019 will be the year for young agri ventures to secure significant investment from global agribusiness enterprises, as well as one with potential for the venture capital community to propel some pathbreaking innovations to markets. In the United States, gene editing will dramatically transform agriculture productivity with unprecedented surge in crop yield and crop output characteristics. Custom production of grains and high value crops for meeting various consumer preferences will be the driving element differentiating the farm level output. The early stage companies in USA have attracted about a billion dollar investment in 2018 and we expect that there will be even larger surge during 2019 for some of these ventures to take their products to markets. In Europe, there has been surge of enterprises as well that have focused on crop nutrition and crop protection by exploring numerous microbes that are present in plants as well as in the environment to enhance the crop productivity. The microbes naturally available have enormous potential to trigger the true productivity in plants and enhance their resilience to stress factors. The rapid decoding of molecular mechanisms of plant and bacteria interactions has led to notable product outcomes to drive enhancement of productivity and resilience to stress factors. In the food value chain, demand for protein for human and animal consumption is ever increasing. Discoveries made in the last five years in the realm of alternate sources of protein is being translated to market ready products at a very rapid pace. Plant based proteins are a great source of protein that will meet consumer preference for clean label. Algae also holds great promise as an affordable protein production source. Finally, lab generated protein is not too far from market and we foresee that it will hit the market in 2021. The year 2019 will witness the surge of plant-based proteins. The power of data science applied to accessing novel genes and identification of regions to knock out in gene editing or to identify beneficial microbes in a massive library of microbes is enormous. 2019 will see wider adoption of precision agriculture with surge in productivity due to remote sensing and application of drones in crop management. Global movement of food in 2018 was impacted by the trade war between USA and China. China has been a major importer of food and feed grade grains and oilseeds from USA and this will be disturbed by the counter-offense carried out by China by imposing tariffs on the import of grains and oilseeds from USA. On the other hand, China can never be self-sufficient in their need for fodder crops and nutrition crops for food. They will look for alternate sources to secure crops such as Sorghum for animal feed, though it will not be easy to secure quantum of sorghum that they have been importing from USA. It would have been a great opportunity if India had focused on Sorghum to supply to the Chinese demand. We perceive that gain here will be to Australia to meet the animal nutrition needs in China. Early stage companies in China in the agri business sphere witnessed significant surge in funding during 2018. This new trend in China has given impetus to early stage ventures with a level of surge in valuation that has never been witnessed for agri business enterprises in the entire Asian region. We expect this momentum to continue through 2019. India has been lagging behind considerably in adopting technologies for enhancing crop productivity. 2018 has been a year of total stalemate. Application of genomics driven tools and technologies will enhance the food productivity by a factor of 4 to 5 percent year on year in USA effective from 2020. At the other end, Indian research and Indian agribusiness houses have stayed far away from applying any of the contemporary genomics tools in crop improvement. Global innovations in microbes are also a challenge for Indian companies to explore due to draconian provisions of National Biodiversity Act that restricts access to microbes by global and even Indian companies. The definition of the Foreign company specified in the Act turns most Indian companies into the category of foreign companies. This is a serious anomaly that persisted in this draconian act for the last 14 years and we remain hopeful for much required change as we embark on a new year. India can be a great destination for the clean label protein if at all focus is tuned to the protein rich crops. The global demand for clean label protein will be unprecedented over the next decade. It is high time we realized the potential for our own protein rich crops such as millets for not only meeting domestic demand for clean label protein but also the global demand. The demand for pea protein is on the surge and India has significant potential to exploit this opportunity as well. Overall Indian agri business enterprises engaged in input side of agriculture will have no great productivity enhancing accomplishment due to crippled research in the country on account of denial of biotech crops and numerous restrictions imposed on accessing genetic resources. Packaged food products and quick service food deliverers will experience a further surge without any noteworthy innovations in the value-added products. We expect that food delivery solutions will attract significant funding though from E-commerce investors. Indian start-up entities engaged in cutting edge research and novel product development continue to be threatened by lack of translational research funding and Series A funding. The government allocation for start-ups as part of the Startup-India program has not in any way reached these enterprises engaged in high end innovation in food and agriculture . It is a long meandering journey for these ventures to see the light of funding that their peers in USA or Europe or China enjoy today. Other than couple of international venture capital investors currently engaging in investing in early stage agri business enterprises, there are no domestic funds that have bandwidth to invest in early stage enterprises. The Start-up-India fund earmarked has also gone into the hands of the international funds, thanks to the way these funds have been distributed. There needs to be an urgent need to arrest the mortality of 100+ entities that have great global potential if at all they secure timely resources to bring these great innovations and products to markets.